November is National Diabetes Month, but for the more than a million children and adults in the U.S. living with Type 1 diabetes, every day and night is a constant reminder of a physically and emotionally tedious disorder that requires constant monitoring. "I wear an insulin pump, a continuous glucose monitor, do several finger-sticks a day, count carbohydrates," said Bridget Kelly, a mother of two who was diagnosed in her 20s and now in her 40s. "Type 1 diabetes is like a second job that you can’t quit." People with Type 1 diabetes must work to keep their blood sugar in a normal range. High blood sugar over a long period of time can lead to devastating complications. In the short term, blood sugars that are too high or too low can be deadly. Kerri Sparling, from the blog SixUntilMe.com, also is a mother of two and was diagnosed in second grade. No one else in her family has Type 1 diabetes, and she remembers her parents being very upset with the diagnosis. Her parents gently replied, "No, honey -- all the Christmases." 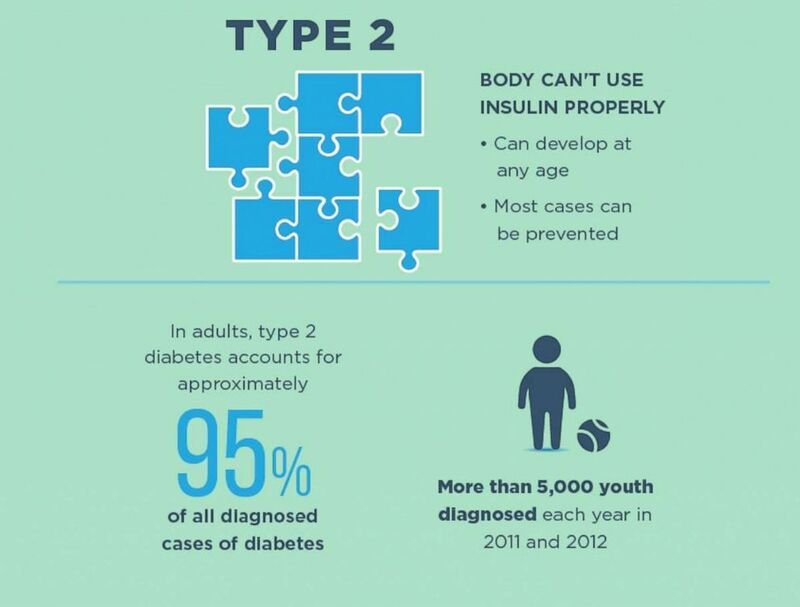 Type 1 diabetes can strike people at any age and in any condition. Once called "juvenile diabetes," we now know people can be diagnosed as children or adults. Symptoms often include extreme thirst, frequent urination and sudden weight loss, leading to a medical visit during which a person is given a blood test -- the only way to identify Type 1 diabetes. For those at risk, their blood sugar is dangerously high. Type 1 diabetes is an autoimmune condition in which a person’s immune system attacks the insulin-producing cells of the pancreas, and it can no longer make insulin. Insulin is essential for life because it delivers glucose, aka blood sugar, which all cells in the body need to function. There may be instant relief after diagnosis, knowing that there is a name for what is happening and that there are monitoring systems -- and that insulin that will be available for daily treatment. But for a person with Type 1 diabetes, life is never the same. "After my diagnosis, I was ready to do whatever was necessary to take care of this disorder, but it's unimaginable the amount of work that is required to keep your blood sugar within a safe range when your pancreas stops making its own insulin," Kelly said. This is different from the more common Type 2 diabetes, most often seen in adults with obesity, high blood pressure and high cholesterol. Both types are believed to have a genetic component, and both are linked to the pancreas. In Type 2 diabetes, however, the pancreas still makes some insulin and it can be controlled with oral medication, exercise and diet. 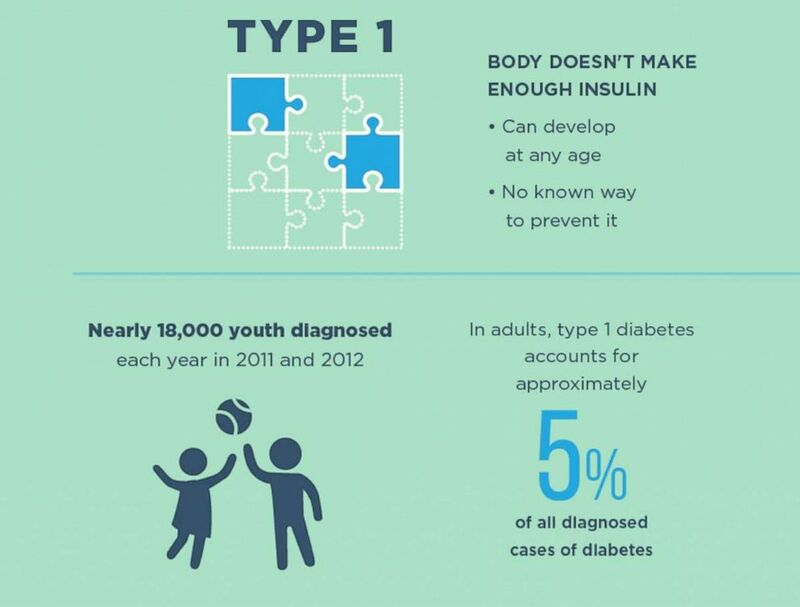 There is currently no way to prevent Type 1 diabetes, typically referred to as T1DM, and there is no cure. ABC News' Medical Unit has previously reported on the technology available now to make managing diabetes easier and the solutions on the horizon. For now, it's a very difficult disorder to manage, surrounded by second-guessing by the individual and the well-meaning people around them who may offer dietary advice without understanding Type 1 diabetes. "I choose when I eat my carbohydrates carefully," Kelly said. "So if I want to have pizza or chocolate cake I can. ... but I need to know how many carbohydrates are in that food and take the necessary insulin through my pump, so my blood sugar doesn't skyrocket. And I can't take too much insulin or my blood sugar will plummet and I can go into a coma and worse." "I'm also considering variables like whether I’ll be exercising soon or sleeping soon and what my current blood sugar is," Kelly added. "I have to think of all those things before I eat and make insulin dosing decisions. So it's not helpful if other people are commenting on my meal choices." Every day, a person with T1DM needs to make many decisions: They need to check their blood sugar levels with a finger-stick test regularly, especially before they eat; inject themselves with insulin, as no pills are available to treat T1DM, or use an insulin pump device; and actively think about what they're eating -- how many carbohydrates every meal or snack contains. 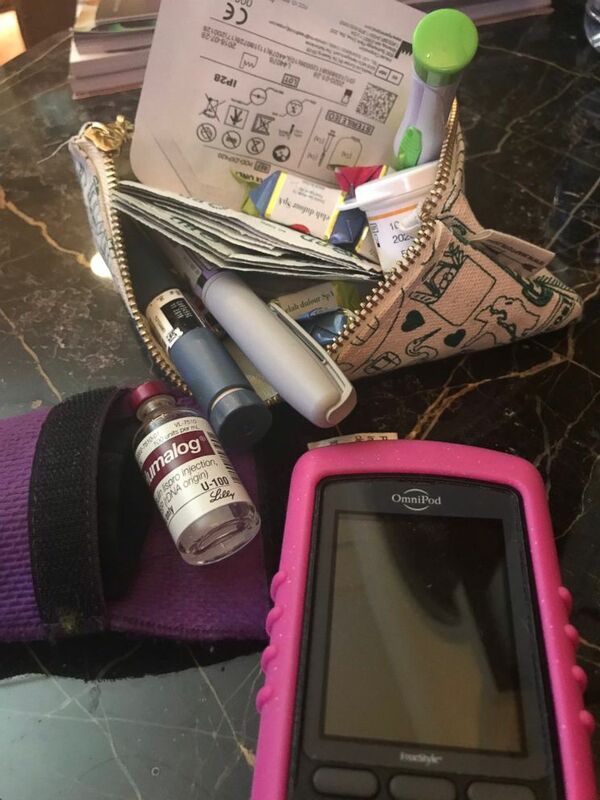 Risa Pulver shares what she keeps in her bag to manage her Type I diabetes. If they're sick, more active than usual, gained or lost weight, they need to adjust the insulin doses; these variables are difficult to manage. And finally, they need to watch out for dangerous signs of blood sugar being too low or too high. They may begin to learn to care for their own body better than any health care professional can. And they need to do this every hour, of every day, of every year. There is no quitting or putting diabetes on hold. 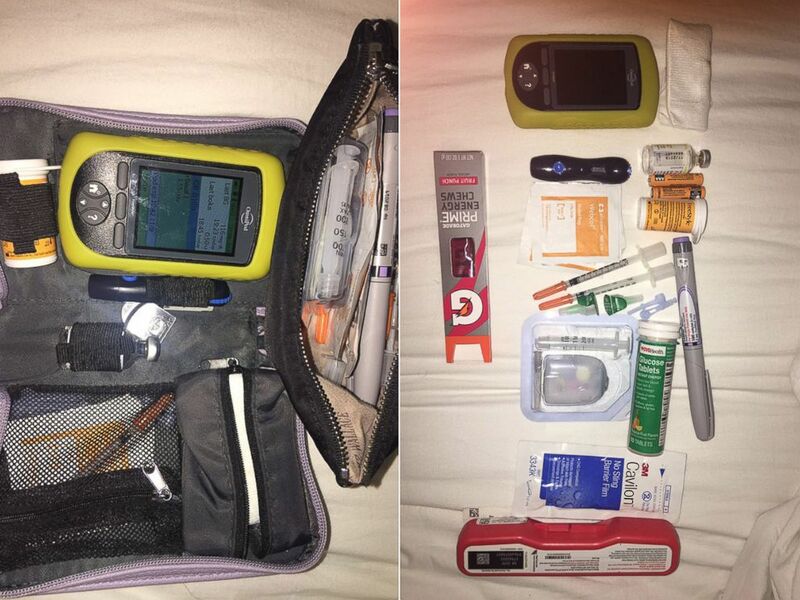 A woman on Twitter shares what she keeps in her bag to manage her Type I diabetes. Carl Armato, CEO of Novant Health, recently published "A Future With Hope." He was diagnosed with T1DM as a toddler. In the book, he shares important lessons about his 50 years of experience. 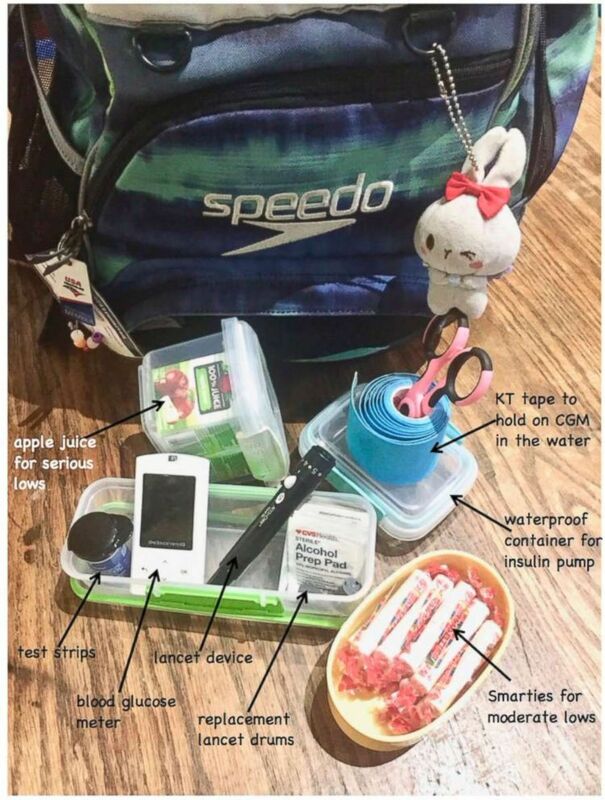 A mother shows what is inside her daughter's swim bag in order to get through practice. "The disease is the disease, but it's how people deal with diabetes and adapt to it that is critical to the quality of life they have -- more importantly, to whether they even have a life to live," he said. He admits it's difficult to manage, but advises from his experience that it's more than possible to have a successful and fulfilling life. "Diabetes is a marathon, not a sprint," Armato said. "Stuff happens. You lose. You fail. Then you have to get back up and fight." Kelly, the mother of two diagnosed in her 20s, works with her endocrinologist, certified diabetes nurse educator and, at times, a specialized nutritionist. She looks at dealing with the disorder as "going into battle." "I always have my diabetes devices with me. I always need to think, 'If I have a hypoglycemia, how am I going to get fast acting sugar to raise it?'" she said. "I keep Gatorade by my bedside and glucose tablets in my purse" to help regulate blood sugar. 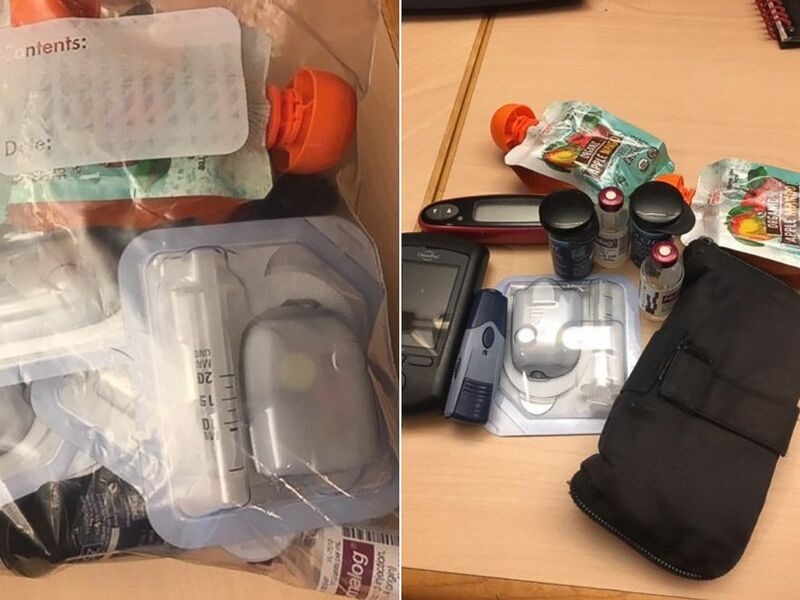 ABC journalist Katie Kindelan shows what she takes for a week a away from home and her daily supplies to manage her TI diabetes. Doctors who treat people with T1DM are endocrinologists. 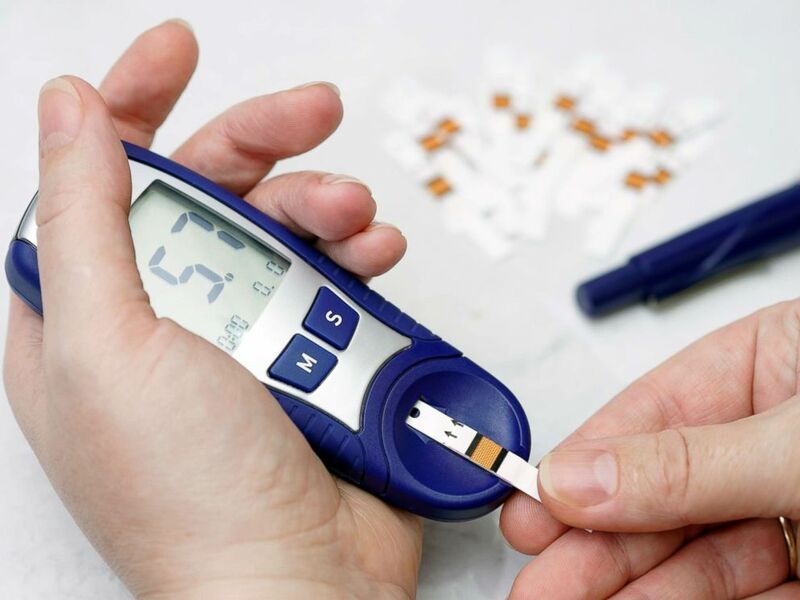 They can prescribe insulin and talk to a person with diabetes about their health, and check blood tests that measure their average blood sugar level over the past three months to see how well they are controlling their blood sugar. Kelly said: "For me, the diabetes online community has been so important. Emotionally and practically, it helps so much to share information and experiences with other people with Type 1 diabetes." "This is a lot to deal with, and most people in my life have very little understanding of what I'm really doing to take care of myself," she added. "Well-meaning people want to suggest 'alternative' treatments involving cinnamon or a special herb, and I have to say, 'Thanks, but I'll always need insulin.'" "It's good to connect with other PWDs who really get it," she added, referring to persons with diabetes. One of the first people to share experiences online was Kerri Sparling, who said that when she started blogging she was one of four or five T1 bloggers she knew about. Today, she regularly speaks on panels at diabetes conferences. "I started Six Until Me in May of 2005 because I was tired of Googling 'diabetes' and coming up with little more than a list of complications and frightening stories," she said. "Where were all the people who were living with this disease, like I have been since I was a little girl? Was I the only person with diabetes out there who felt alone?" She shares her daily experiences online in a very transparent way under titles like, "Love Poem for my Stupid Pancreas," "World's Okayest Diabetic" and "Um, can you eat that? A Halloween Poem." An undated stock image of a person checking their blood sugar level. She's written a book called "Balancing Diabetes" but points out she isn't a medical professional and joked, "I can't even drive a stick." But her openness about her experience is invaluable to a large community of people living with Type 1 diabetes who gather online in Facebook groups, at conferences and monthly meet-ups in their own community to avoid the isolation. "For much of my life, I was the only diabetic I knew," Sparling said. "Thankfully, that's not the case anymore." "When you're diagnosed so young, every life event has included diabetes," she continued. "I went to prom with diabetes. I got my license with diabetes. I graduated high school with diabetes. I had a special pocket sewn into my wedding dress for my insulin pump." In her day-to-day life, she thinks about diabetes every few minutes. From the moment she opens her eyes in the morning until she closes her eyes at night, there are hundreds of small decisions she needs to make to keep herself safe. There is a "variable to everything that you do -- how to get dressed, how far is the drive," she said. "It all becomes automatic after a few decades." If people with Type 1 diabetes don't use newer technologies, like an insulin pump or a continuous glucose monitor, they may need to inject themselves with insulin four to eight times a day and check finger-sticks at least six to eight times a day. Sometimes, they need to check more. They must always be aware of how their body feels when blood sugar level is too high or too low. If it's too high, some people describe feeling anxious, a stomachache, very thirsty or not themselves. If it's too low, which can be very dangerous, they may feel a headache, tremors, heart palpitations, confused, slur speech or even be unresponsive. "We tiptoe that line all the time, between I'm sick and I'm fine," she said. But she doesn’t let that stop her from living her life. "You can do everything everyone else can do, except make insulin," Sparling said. Speaking of insulin, diabetes is one of the most expensive chronic conditions -- insulin prices has tripled in the past 15 years. From 2001 to 2015, the price of Novolog, a commonly used insulin, went from $100 per vial to $336 per vial in the United States. People have been known to ration their insulin, which can be deadly for someone with T1DM. There are generic versions, or alternative types of insulin, as well as patient-assistance programs, which can help to decrease the cost of insulin. The Endocrine Society and other physician and patient advocacy groups are calling on the government to pursue initiatives on insulin affordability. In the meantime, people with diabetes are their own best advocates. What about these things I read online about pumps and sensors, and the 'artificial pancreas?' Is that a cure? Technology in diabetes is evolving at the fastest pace in history and working to improve the lives of people with T1DM. There are insulin pumps that can automatically decrease the amount of insulin you get if your blood sugar numbers are too low or heading low. There are continuous glucose monitors, or CGMs, which sense your blood sugar levels every five minutes without requiring a finger-stick prick. And now, there are systems whereby the CGM can communicate with the insulin pump in a "hybrid closed-loop system." At Boston University and various start-ups across the country, there's ongoing research to build a "closed-loop system," or artificial pancreas, that does not require any human input. We are so close, and yet so far. Even the most advanced systems on the market now still require human input. If the blood sugar is too low or too high, the sensors or pumps will beep, and ask for a confirmatory finger-stick test. People still need to input the amount of food they’re going to eat, or make adjustments if they’re going to exercise or not eat for a long period of time. Machines can experience technical errors or malfunction, however; tubing may kink or get clogged, the sensor or pump can fall off or the battery may run out. You can't turn your brain "off" no matter how good the technology is. Sparling, the blogger, said she has "hope for a cure," but "I have to live today." There are many famous and successful athletes and professionals with T1DM who never let their disease define their careers. Mountain climber Will Cross climbed Mount Everest, professional football player Mark Andrews and Supreme Court Justice Sonia Sotomayor, to name a few, continue to achieve their dreams while living with T1DM. My loved one was just diagnosed with T1DM. What can I do to help? "What anyone with diabetes soon learns is that you can't do this alone," said Armato, the CEO of Novant Health. "A good steady support system ... is like the breath of life." -- Understand this is a disease that requires nearly 24/7 attention. Have empathy. Be positive, not critical and judgmental. -- Learn about T1DM from trustworthy sources instead of passing on things you've heard. -- Recognize the signs and symptoms of low blood sugar. -- Know where your loved one keeps their glucometer, insulin supplies and glucose tabs. -- Know the phone number of your loved one's doctors. "You can do the absolute best," Sparling said, "and things can still happen." There are some good, reliable online resources and meetings for people with T1DM and their family and friends. Armato and Sparling emphasized the importance of having support. "Find your support community, someone who can say 'me too' and be there for you -- it's very powerful -- someone who won't judge you and will hold you when you're down," Sparling said.